← Condemned Making a Possible Return to the Spotlight? Battlefield Hardline Beta Impressions – Bad Boys, Bad Boys, Whatcha Gonna Do? Posted on February 6, 2015	by Derek "Gamer Crash"
With it’s release date quickly approaching next month, the Battlefield Hardline beta kicked off earlier this week giving many folks their first hands on time with the game in a near finished state. 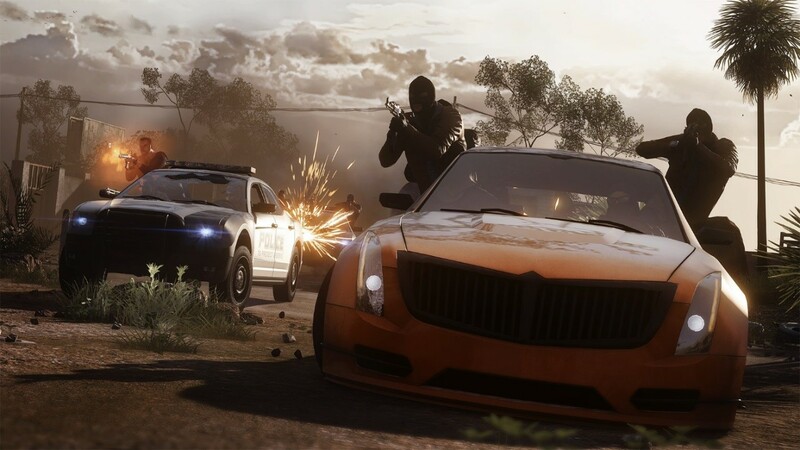 For those not up to date on their shooters, Hardline mixes up the traditional military style that the Battlefield series is known for and instead places the focus on more urban environments with the police verses criminals. As such, traditional military vehicles such as tanks, jets, and other heavy vehicles are absent replaced by more common cars and trucks. Developer, Visceral Games has also promised an exciting and thrilling single player campaign but we’ll need to take their word on it for now as the beta was strictly limited to a few multiplayer modes: Hotwire, Heist, and Large Conquest. So how is their take on cops versus robbers? Did Hardline leave me with a good impression or should it be fined and thrown in jail? Upon booting up the beta, I was immediately greeted with a familiar looking menu screen which Battlefield 4 veterans should immediately be comfortable navigating. Granted, the look of the UI and color scheme is a little different, but a lot of familiar terms are thrown around like Battlepacks, Battlelog and all of that. There’s a lot of menus to click through in order to find specific things which may be tough on new players but for Battlefield 3 and 4 players, it’s like putting on your favorite pair of pants…or however that phrase goes. As previously mentioned above, only three modes are open to you during this beta. Heist, which was one of two modes on display last summer during the closed beta test, features the robbers trying to break into a bank vault and escape with the money while the cops are obviously trying to prevent this from happening. Think of Heist essentially like a one sided Capture the Flag. Hotwire on the other hand remixes what players know as Conquest. Instead of trying to capture stationary points on the map, the capture points are actually vehicles (hence the “Hotwire” name). Players work to steal the cars and keep the speed above a certain limit which effectively captures that point. It’s like a cross between the movie Speed and a traditional conquest mode, only the vehicle won’t explode if you hit the brakes or crash. Out of all the modes available, this one proved to be the most exciting as vehicles whipped around the streets with cops and robbers both hanging out of car windows shooting at each other. If you’re not in a vehicle, expect to be killed often. Since this is a Battlefield game, many of you might be wondering how it holds up on a technical level. I can’t say I blame you after the disastrous way Battlefield 4 launched. Considering this is simply a beta, we’ll have to wait and see once the retail rush hits, but so far the beta has held up spectacularly. I’ve had no trouble finding a match and the connection speed is quite fast. Even though this isn’t the final product, I like to think this is a positive sign as I remember having all sorts of connection issues during the Battlefield 3 and 4 betas. We’ll see though. Gameplay wise, Hardline feels like it’s faster than the past games. Now, we’re not talking Call of Duty fast, but I did find myself getting into the action much sooner and more often than in past games like Battlefield 4. I think part of that stems from the map design which feels smaller, in a good way, than past games which typically feature massive landscapes in order to accommodate large military vehicles. While maps like “Dust Bowl” are large in their own right, they’re still small enough where you don’t feel like you spend the majority of your time running to get to where the action is, especially if you don’t have a vehicle. Battlefield is known for destruction and on this end, I feel like Hardline aligns more with Battlefield 3 in the fact that the game allows for minor destruction, not the total chaos you could unleash with the Battlefield: Bad Company games. You can’t level buildings, but you can punch holes in certain spots. Battlefield seems to be trending this way, so it’s about on par with recent games. Typically, it’s in the DLC map packs where you see the destruction element ramped up for multiplayer so we’ll have to wait and see if this is the case for Hardline as well. I’m a person that really appreciates the little touches and to that end, Hardline’s load screens are presented like a live news broadcast to better frame the upcoming match and give it a tiny bit of narrative. It’s a little detail but it’s appreciated. Visually, the game is definitely on par with what we’ve seen on next gen platforms with Battlefield 4, I couldn’t really see much of a difference between the two. That’s not to say it’s a bad thing as the lighting and sound effects are still top notch for a shooter. Granted, this is simply a beta test so there’s a chance the game will look better in March, just don’t expect the game to push these systems. Overall, if you’re a fan of Battlefield, I see no reason why you wouldn’t enjoy Hardline. It’s essentially a Battlefield experience with a few new things thrown in and a cops/robbers skin wrapped over it all. I had a good time, but the experience felt very familiar and I just don’t know if it’s enough to capture my interest again. At the game’s core, it’s Battlefield and many of you already have certain feelings about that. There are no real surprises with this one, it’s an experience that feels very much like a faster paced Battlefield game. If you like shooters or Battlefield in general, Hardline has you covered. 2 Responses to Battlefield Hardline Beta Impressions – Bad Boys, Bad Boys, Whatcha Gonna Do?